When it comes to math and statistics, I don’t remember much from those courses in high school and college. I may have even tried to block it out like a bad memory. However, I do remember the instructors’ warning about the power of numbers. Those little digits possess the ability to sway public opinion, whether they reflect the truth or not. This week’s featured title rhymes with a former Word of the Year and describes a similar concept. Seife, professor at New York University, takes Stephen Colbert’s famous term and applies it to the numbers game. He defines proofiness as the “art of using bogus mathematical arguments to prove something that you know in your heart is true—even when it’s not.” The author contends that the media and government utilize the practice of proofiness to persuade the American people of their political viewpoints. 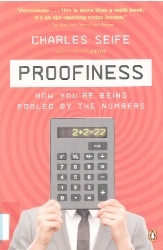 Seife blinds the reader with real mathematics to shed light on the increased deception, and provides plenty of sources for further research. This entry was posted in new stuff tuesdays and tagged books, government, mathematics, media, new stuff, public opinion, statistics. Bookmark the permalink.